Damages from special fraud cases in Japan totaled a record ¥48.69 billion in 2013, a 34 percent increase from the previous high of ¥36.44 billion that was posted in 2012, according to National Police Agency statistics. 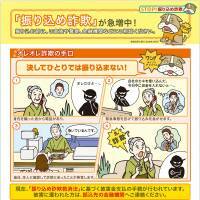 The special fraud cases are a blanket term for what was originally dubbed “It’s me” fraud (オレオレ詐欺, or ore-ore sagi). The first time the phrase is likely to have appeared in print was on Feb. 13, 2003, in the Tottori edition of the Asahi Shimbun. “Man pretends to be son, makes (victims) wire money, Yonago police arrest and file charges for fraud,” the Asahi headline said. The article said police officers had completed their investigation and prosecuted an unemployed suspect, 32, for alleged fraud. He had pretended to be a family or friend of strangers on the telephone and repeatedly defrauded them out of cash. According to the article, the suspect phoned a total of 11 men and women living in Shimane or Osaka prefectures at random between August 1999 and December 2002. At the beginning of the call, he would say, “It’s me, it’s me,” and would pose as a friend or son of the victim. He was suspected of defrauding the victims of a total of ¥10.67 million. The article carried a warning from the police that advised people to calmly and carefully check the identity of any person calling them in order to avoid being deceived. (That warning has since been repeated for 11 years). This short article outlined the prototype of a fraud that has since evolved and branched out. The variations are so great that the name for it has changed several times over the years. When “It’s me” became too well-known, different ruses were used, and the police renamed it “Wire me the money” fraud (振り込め詐欺, or furikome sagi). 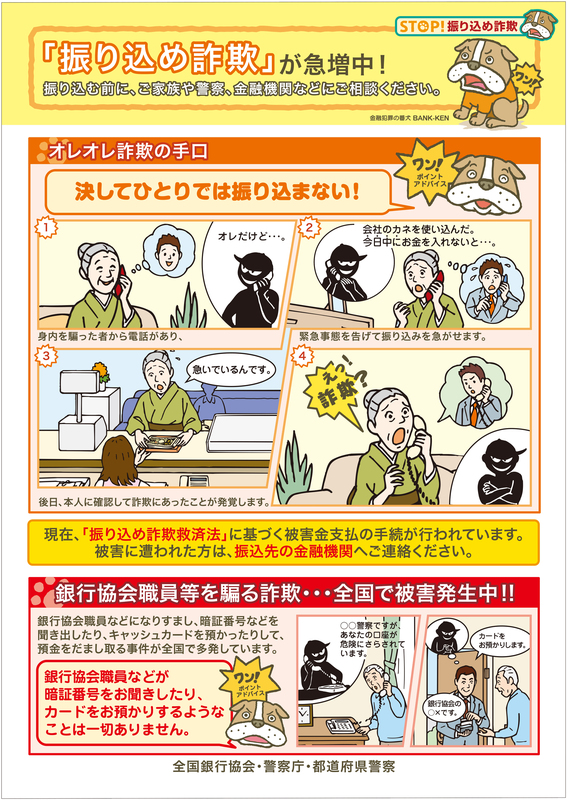 The Metropolitan Police Department decided last year that a better moniker was needed to create public awareness and, after taking submissions from the public, selected “Help me, mom!” fraud (母さん助けて詐欺 , or kasan tasukete sagi) as the winner. The runner-up was “fake telephone” fraud (ニセ電話詐欺, or nisedenwa sagi), while another option, “using parental love for their children” fraud (親心利用詐欺 , or oyagokoro sagi) had legs but didn’t catch on. The National Police Agency this year has chosen to include such cases in a category labelled “special fraud,” which includes eight different types. There are cases in which the bogus callers pass themselves off over the telephone as loved ones of the victims, often elderly, and ask for urgent money transfers to get them out of trouble. Troubles include: running afoul of gangsters, traffic accidents or getting their girlfriend pregnant. People are charged for visits to Internet sites they never used — usually pornographic. There is even an elaborate scheme that requires two swindlers working in tandem to pull off. One culprit calls the victim pretending to be the police and warns them that their bank account has been compromised. Their partner then visits the mark’s home, posing as an employee of the Japanese Bankers Association, and collects the person’s bank card(s), personal details and ATM code(s). Needless to say, at this point the person’s bank account really is compromised — and the criminals withdraw as much cash as they can before ditching the cards. This month, a group of three teenagers were arrested for scamming several hundred people out of ¥408 million using the “It’s me” trick. Police seized 550 bank cards the boys used during their crime spree. While police note that many of these frauds involved yakuza, it’s also apparent that civilians are raking in the dirty lucre as well. Some police officers and gangsters claim the practice existed in the late 1990’s, it just didn’t have a fancy moniker. Swiss journalist Nathalie-Kyoko Stucky in an April article for the Japanese monthly ZAITEN magazine, said that “It’s me” fraud was even found in Europe as early as 2000. In Switzerland and France, it’s known as faux neveu (“fake nephew” fraud). I used to think that only Japanese people fell for this trick but that’s clearly not the case. Kimiaki Nishida, a noted psychologist at Rissho University, explains why people fall for the scam. He suggests the crime also takes advantage of Japanese cultural values such as tacit understanding (以心伝心, or ishindenshin) and a samurai warrior’s compassion (武士の情け, or bushi no nasake). Handing over cash in person was the most prevalent form of delivering money to swindlers, the National Police Agency said, accounting for a little more than 40 percent of the cases. Bank transfers were used for less than 40 percent. Postal and parcel services were used to deliver money as well. Damages from the classic version of impersonation fraud increased 52 percent to around ¥17 billion last year and I’m guessing that those three teenage boys helped the tally swell. He has a point. I love the low crime rate in Japan but if given a choice between how I’m robbed of my money, I’d prefer to be mugged or pay my Tokyo Electric Power Co. electricity bill.